As an identifiable community in the Canadian mosaic, we face what every other community faces, assimilation, integration and a growing loss of our immigrant culture. We’ve held onto our identity for a long time. It’s changed, of course, because to adapt is to survive and prosper. The process is inevitable. As each generation grows old and dies, a new generation more distant from Iceland appears. However, we are not helpless, hopeless items subject to the forces of time or society. We do have resources. We’ve just got to organize and use them. How well we will maintain our identity depends on us and what we do. Our ancestors were devout. Religion mattered to them. In an environment where they were subjected to the vagaries of the weather, where their lives could end at any moment from disease because there were no effective medications, where there was virtually no control over their daily lives (they had to be attached to a farm; they could only change jobs once a year), they had to put their faith in the Lord. I’ve seen how important religion was to them. Space and weight were critical to people emigrating, yet they brought Bibles. Years ago, when I was collecting Icelandic books to keep them from going to the garbage dump at Gimli, I had a box of Bibles. No one wanted them. People couldn’t read them anymore. As well, church attendance had fallen off so there wasn’t any great demand for any Bible, never mind those printed in Icelandic. The box of black Bibles in my basement was ironic because when Ebenezer Henderson went to Iceland and spent the years 1814-15 there, he was there because Icelanders didn’t have Bibles. He has seen to the printing of Icelandic copies of the Bible and with the help of the British and Foreign Bible Society, he traveled to Iceland. The Icelandic merchants at Copenhagen allowed him to send the Bibles to Iceland without charge. A Westy Petræus, Esq. takes 1183 Bibles and 1668 New Testaments to Iceland as a favour to Henderson. At Tiörnabæ, the farmer buys both a Bible and a New Testament. Henderson has just turned to re-enter his tent when two servant girls came running with money in their hands to pay for a New Testament each. A number of people collect at the door of his tent and a young man to whom he has given a Bible reads from the third chapter of the Gospel of John. The people sat or knelt on the grass to listen, tears running down their cheeks. Today, I see no families so devout that they will ride on horseback or even in a car for miles to purchase a Bible. Nor, do I see families gather together to worship in the absence of a minister. 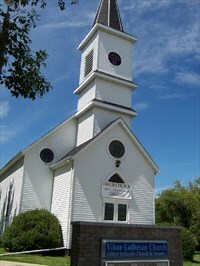 The church, in its social role, held the community together, provided an opportunity to gather, to participate in group behaviour. It provided leardership. The ministers, in spite of often being poverty stricken, were still important figures. Today, they are in short supply, still paid badly, preach to half-empty churches, are collateral damage to scandal, are no longer the best educated individual in the community, and no longer have the social status they once enjoyed. Society grows more secular by the day and while sects appear whose beliefs and behaviours, while claiming to be Christian, are bizarre. We can support the religious aspect of our heritage by going to church. If parishoners want, if there are enough of them of Icelandic background, it can become a centre for the learning of the Icelandic language and history and genealogy. If parishoners want. We can make an effort, through the church, or through the Icelandic clubs, to actually learn about Iceland‘s church history. The same is true for the church history of religion in the Icelandic population in North America. However, even after all this time, there are still sensitivities over religious conflict from earlier times. The unspoken choice has been to avoid our religious history rather than risk inciting old conflicst. It seems a strange choice given that our problem is that most people don‘t care. When was the last time you had a serious discussion about the importance of the church in daily life in Icleand or New Icleand? Unfortunately, we‘ve lost the physical evidence of our religous heritage. I grieve the loss of the wooden churches at Gimli, Riverton and Hnausa. Many years ago, I saw the Hnausa church. It was small, beautiful, surely an act of art to God. I saw it after it was vandalized. One would have thought it had been overrun by the bitter enemies of Christianity.No church stands there now. What was lost was not just a place of worship but a symbol of our heritage. 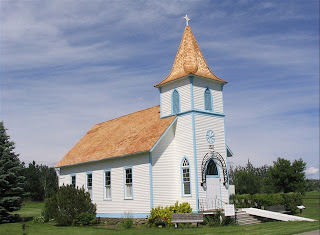 We are fortunate in having the Unitarian church in Gimli preserved. It was built in 1905 and, at least, gives an indication that religion did play an important part in the Icelanders daily life. Here, we need to take a lesson I was taught in the catacombs under Kiev by my Communist guide. We had travelled for a long time along the tunnels, with bodies on every side, then came to caves filled with gold and silver religous items. I was amazed. I said to my guide, “How is it that they are here?“ He replied, “It is not because they are religous. It is because they are our history.“ I think that the members of our Icelandic North American community need to take that lesson to heart. Lutheran, Unitarian, United, Catholic, Agnostic, Heathen, whatever, we need to preserve our history. Support the preservation of our history. The same is true for the Vikur Lutheran church in Mountain. Our ancestors, only nine years after the settlement in New Iceland, thought having a church was so important that they built this church. Now, it needs a new roof. The cost shouldn‘t fall only on the local people. Or only the Americans. It is our history. It is our heritage. 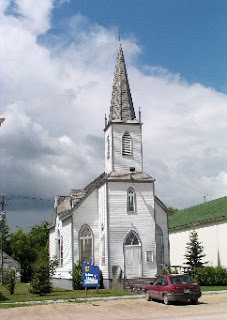 Thank goodness the people of Markerville have preserved the Markerville Lutheran Church. Today, we get DPT shots. Mothers and fathers don‘t have to pray to God that their children don‘t die in their arms from diptheria. Read Wasteland with Words to find out what that was like when they had nothing but prayer. But just because we now have science to ask for help, doesn‘t mean that understanding and preserving our religious past can‘t help preserve our heritage. If we don‘t, we‘ll never understand who we are or why we are the way we are.